Please note: If you used to have the Schonstedt Model MAC-51Bx, you are aware it would do BOTH. It was a magnetic locator and a pipe/cable locator in one. The Schonstedt Model MAC-51Bx was discontinued and the Combo Kit MPC is the replacement. 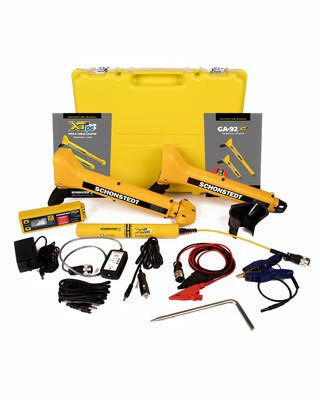 The Schonstedt MPC-300 Combo Kit includes both a XTpc Pipe & Cable Locator, as well as a GA-92XTd Magnetic Locator. Buying these two in a combo kit is a better deal than buying them separately. And, the carrying case holds both instruments for convenience on a construction or locating site. Helpful Tip: 33kHz is useful in tracing electrical lines. (Go with the MPC-800 if you want to locate more gas and water lines than electrical). Output Audio: Signal increases in frequency with gradient field intensity. Idle frequency = 10 Hz. Find it all Underground with the Schonstedt Combo Kit MPC: CABLE TV LINES, CAST OR DUCTILE IRON PIPES, COPPER PIPE, CORNER MARKERS, CURB & VALVE BOXES, ENCLOSURES, FIBER OPTIC with TRACER OR SHIELD, GAS LINES, WEAPONS, HAZMAT DRUMS, IRRIGATION LINES, MAG & PK NAILS, MANHOLE COVERS, MARKER MAGNETS, MANHOLD LIDS, MUNITIONS, PLASTIC PIPE W/ TRACER WIRE, POWER LINES, SEPTIC TANKS, STEEL PIPES, STREET LIGHT POWER, TELEPHONE LINES, WATER & SEWER LINES, WELL CASINGS. Our department has enjoyed this so far and it has saved us a lot of time. We've owned Schonstedt products before and probably would not buy anything else. They are still made with quality first from what I can tell. Thanks for the quick shipping. It all arrived undamaged, full factory warranty. Steve M.